NEW DELHI: For second year in a row, India is the third largest victim of terror attacks across the world after Iraq and Afghanistan while CPI-Maoists, which carried out 53% of the total attacks in India, is the fourth deadliest terror group after Islamic State, Taliban and Al-Shabaab, according to the data released by US department of state on Thursday. Till 2015, Pakistan was the third most affected country in the world. The national consortium for the study of terrorism and responses to terrorism, contracted by the US department of state, has claimed that Jammu and Kashmir witnessed a 24% increase in terror attacks in 2017 and an 89% increase in the number of people killed in those attacks. Out of a total 860 terror attacks across India in 2017, 25% were reported from J&K alone. Indian officials said that there is a major difference between terrorism in Pakistan and India. “Here in India, most of the terror activities are either sponsored by or emanating from the soil of Pakistan and its agencies and military are allowing it. On the other hand, Pakistan is now facing the attacks from terror groups it harboured and raised for decades,” an official said. 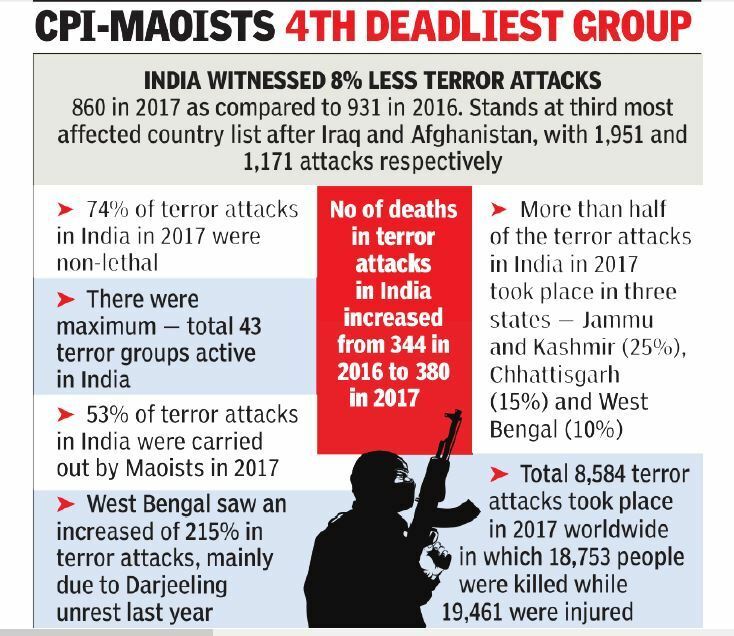 Terming Maoists as the fourth deadliest terror group in the world, the US study has stated that it was responsible for 53% attacks in India in 2017. “The frequency of terrorist violence by Maoist extremists in India declined between 2016 and 2017 with respect to number of attacks (from 338 in 2016 to 295 in 2017); however, the number of people killed increased 16%, and the number of people injured increased 50%,” it said. While Maoists were involved in 295 total attacks in India, only global outfits ahead of them are Al-Shabaab with 353 attacks, Taliban with 703 attacks and Islamic State with 857 attacks.